If you have a question about the reconstruction of Kabul, or its context in the current situation or history of Afghanistan, you are invited to ask your question here. If we can, we will post an answer to your question as soon as we are able (please allow us 2-4 weeks for research and networking on your behalf). This section of the project is now maintained as an archive and questions can no longer be asked or answered. If you are wondering why a previously submitted and/or answered question is no longer visible on the site, that question and/or its answer was most likely hacked by a spammer and had to be removed in order to keep the site clear of redirecting links and other irrelevant content. Feel free to sign a name to your question or to ask anonymously, as you prefer. If you don't have a specific question, or have already submitted one, you are invited to FOLLOW THE INFORMATION. How can i find a electrical engineer job in afghanistan ? Herat is one of the most legendary cities of Central Asia, comparable historically with Samarkand. Kandahar and Jalalabad are also major cities. Who take care of the old people in your country? Their relatives or the community? Usually relatives, although there is a government program called the Department of Martyrs which provides minimum-wage employment for war widows, since widows are often cast out by in-laws. Life expectancy in Afghanistan is not particularly high so the burden of care for the older generation is quite the same urgent issue that it is in Western societies where the baby boomers are now retiring. Um, as far as I know, there are no skyscrapers in Kabul yet, although the first full-on American-style mall, which is unusually tall for the city at 10 stories, opened in November 2005. It was recently the subject of a gushing feature by Terry Moran on Nightline on ABC. The Nightline story, titled -A day in the life of Kabul-, neglected to mention several interesting details that were, however, highlighted in the IWPR story on the mall, including the fact that security for the glass-walled building is provided by 40 guards, most actually members of the interior ministry police, and that both guests in the hotel (which takes up the upper four floors of the building) and shoppers in the mall tend to be foreigners, and the rest are among the few relatively wealthy Afghans who work with international NGOs or have money coming in from overseas. The building itself cost $20 million USD to build, and commercial space inside it rents at $50 USD per square foot; three glass elevators and four escalators present a startling contrast to the many Kabul homes that survive completely without electricity, or get by with only a few hours of power each day. The Afghan Chamber of Commerce also maintains job listings, although they do not work on my Mac. Hi KR, Who is responsible for issuing an account so that I can participate in sharing my idea...thanks......I am simple coool boy not related to any party or any political organization but just an OR. Sorry to say that the information section of this project is no longer active, so no new accounts are being issued. If you would like me to link to anything you have written elsewhere, feel free to email me at mariam[nospam]@kabul-reconstructions.net - just take the nospam brackets out of the address. Otherwise I can recommend the afghaniyat listserv on Yahoo! Groups as a good place to share ideas with a lot of diasporic Afghans. Are there any plans ever to locate and destroy the land mines left by Russiain Afghanistan? A quick look at the Development Gateway database of current and ongoing international development projects in Afghanistan reveals that since 2001, approximately $39,536,494 (USD) has been pledged or spent on programs related to mineclearing, land mine surveys and information gathering, training minesweepers and clearers, and developing new equipment to clear mines. The primary donors are USSD and USAID, followed by the UK, Japan, the European Union, and Spain. Some of the work is carried out by the UN land mine program and more is carried out by the US military in conjunction with specially trained units of the Afghan army. As far as I know, at this time there are still (especially in certain provinces) an enormous number of unplotted, unexploded land mines in Afghanistan. She is one of the first two graduates (the other being Nabila Akbari) of the Cisco Academy technology training program referenced in the question about the roles of women in technology below. I believe they actually went to the U.S. and did the United States Telecommunications Training Institute course there, and they now run the academy program in Kabul through the Ministry of Womens Affairs. What is the population of Kabul in 2005? Honest answer? As in most places outside the Western world, it would depend on who you would be working for, how you would live there, and how you would treat others. If you would be working for the U.S. government in any way, or for any security contractors, this is not a good time to go. People are really, really unhappy about the prisoner abuse reports that are emerging from all quarters, and one of the big ISAF bases in Afghanistan was Canadian, so even though people like ISAF a lot better than American soldiers, they still see them (and by extension your government) as collaborators in these acts. If you would be working for an international NGO, and living in a guesthouse full of internationals who can clearly be observed to live and act only within the international scene, the separate NGO/diplomatic bubble that exists in the city, I think it is also a bit dicey -- there is bound to be a growing resentment of this other Kabul, with its own economy and society and culture, that does not quite mesh with the Afghan city. If you come to work for the Afghan government or for an Afghan NGO or contractor -- to really work for Afghans and live with Afghans, putting your talents in service of what they need and want for the city and adapting to their culture, instead of expecting them to adapt to yours, then you will be welcomed with open arms and a kind of hospitality, generosity of spirit, and good faith that is almost unthinkable here. PRT is the abbreviation for Provincial Reconstruction Teams, small operating bases installed by the US in several Afghan provinces from which a combined civilian + military force work on reconstruction projects or provide security for aid groups operating in the area. Wikipedia has a good summary of the idea behind PRTs and the areas where they have been in operation. The PRT concept has been criticized by a number of humanitarian aid groups working in Afghanistan, who felt that it further blurred the (already fuzzy) lines between military and humanitarian interests in the Afghan reconstruction, thereby placing their aid workers in danger of attack from groups opposed to the US military presence in Afghanistan. The debate over PRTs and the new approaches to PRT implementation later attempted are nicely summarized in a special report from the United States Institute for Peace. what is the pathway to leadership of Zahir Shah and evaluating the impact of his leadership style on the leader? mariam: Well, as the ex-king of Afghanistan, Zahir Shah was basically born into it leadership and exercised his power rather well through the 1964 Constitutional Jirga and the democratic structures it put into place; his leadership was then seized from him in a coup, whereupon he abdicated the throne and lived in a comfortable exile in Italy for many years before coming back to Afghanistan to be declared the Father of the Nation - basically a ceremonial title. While his family has re-occupied their old palace, they have renounced all offical claim to the throne. He appears at Jirgas to bless the proceedings and his benevolent presence, while having no real effect on the way politics play out in contemporary Afghanistan, does legitimize the present administration in the eyes of Afghans who remember his reign nostalgically as the last period of stability, prosperity and unity in recent Afghan history. How many people wants to go to afghanistan from Europe and Amerika? mariam: Thanks, Recen. You are right about the "war carpets," as they are sometimes called. As far as I know, they were produced mostly in refugee camps, particularly in the border zone with north Pakistan. I think though that while the original customers may have been mainly Russian soldiers, the coded messages of resistance and oblique histories of the civil war that were woven into these rugs have gained them a following of niche collectors from all over the world. 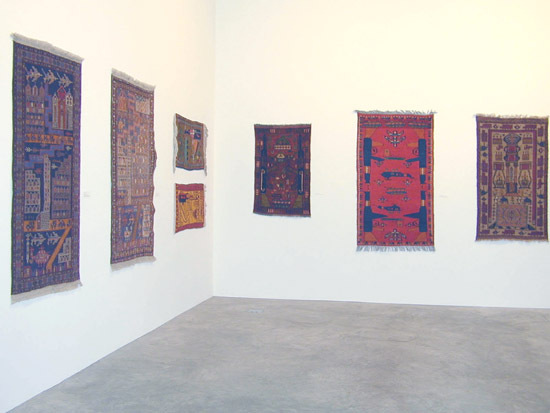 For example, the L.A.-based Israeli artist exhibited his collection of Afghan war carpets as an installation at Postmasters Gallery in New York last year. I uploaded a jpeg installation view of his collection, which shows 7 examples of these carpets, to the INFORMATION page for you. Will try to see if I can photograph any more while I am in Kabul at the end of December. Are there primary financial services in Kabul like a stock market, insurance, social security, welfare, etc. ; and have they been reconstructed in any substantial ways? mariam: The short answer to your question is no, not at the moment. As can be traced from the original National Development Framework (NDF) developed by the interim governments Afghan Assistance Coordination Authority (ACA) in early 2002 to the projects listed in the current National Budget, the reconstruction of the financial systems of Kabul has had to start at the much more basic level of first re-issuing the currency (the Afghani, successfully stabilized in October 2002 by a radical recall and re-issue that changed its value from less than .00025 USD to about .02 USD) and then working towards the establishment of a Central Bank that could provide credit services. The private sector economy has definitely not yet reached the stage where it can support a stock market. In terms of insurance, the government plan seems to be to encourage the development of this area through the private sector. While as yet there is no social security or welfare as a formal program, I believe there is some form of refugee assistance available from the central government -- will try to find out more for you on that. mariam2: During my recent visit to Kabul I was reminded by my father that many of the financial services that are provided formally in places like the U.S. by banking systems, like credit and financial insurance, have been provided for centuries in Central and South Asia and the Middle East by the hawala or havala network, a paperless system for transferring money across distances, without actually moving it, based solely on relationships of trust (often longstanding or inherited family relationships). The persistence of hawala networks in Afghanistan and the region have often been cited as the primary reason why it is so difficult to --follow the money trail-- for terrorist, criminal and intelligence operations in these areas of the world, because their transactions are carried out over these networks that keep no records. Besides the above links, I have also put a PDF of a paper published by the IMF that debunks this association to a certain extent on the INFORMATION PAGE for your reference. mariam: Hi Ajmal- I hope some of the other participants will also respond to your question, since I believe the question of identity is one that can only be approached on an individual basis -- because it is composed equally from circumstances and choice. My own construction of my Afghan identity has been extremely fluid over the course of my life and has been determined to a great extent not only by a simple genetic or cultural coding of heritage but also by my context: within a family that is Afghan but also Lebanese and American; within a community that has been at various times entirely Western, primarily Arab or Arab-American, largely immigrant, or partly Afghan; within a country, the United States, that has veered between intense attention to and involvement in the affairs of Afghanistan and near-complete ignorance of them; and within a world of nations where the claiming of Afghan identity has held wildly different degrees of future possibility (for mobility, for citizenship, for economic gain, for social capital) at different points in space and time. Oddly enough, the precise moment when I claimed my Afghan identity fully for the first time was also the moment when I was precisely split between two of my three inseparable identities by the shocking impact of the U.S. bombs hitting Afghan soil. In those painful, pointed days of October 2001, I felt the familiar need to embrace the site under threat, to record the trace of the almost-lost object, combined with the confused and conflicted guilt of a fully assimilated Afghan-American -- as if suddenly I had found myself in the scope of a B-52 gun camera while my own manicured hands signaled the missile release. In the wake of the bombs, I awoke to find myself nominated by all the non-Afghans around me as the speaker of the new Afghanistan, the instant authority who was assigned the task of creating through my words a bridge they could walk across to reach this country they suddenly felt was mine. Perhaps I could have refused both the task and the sense of finding a name, if the reconstruction efforts had not acquired that heady momentum that created such a potent sense of possibility: the possibility that the reconstructed Afghanistan might actually be mine, or yours - might belong to or have a place for or be shaped by someone born elsewhere, written in another language, constituted by another system of belief. So for me, the creation of a site like Kabul: Reconstructions -- a space where the city (the only part of Afghanistan I have been able to visit) can be envisioned and imagined, the process and progress of reconstruction can be traced, and both the imaginings and reality can be archived -- is part and parcel of this renegotiation of my Afghan identity, which is being continually constructed and reconstructed in tandem with the city and the site. Followup: Say from early 50s till the fall of communist regime in 1992.
mariam: This was a follow-up to the question about Afghans trained in Soviet Bloc countries, which is answered below. What is the total/approx number of Afghan students trained in Soviet Block countries? mariam: Most people in Kabul seem to think it was around 650,000. We will see if we can get some kind of source for this number later. I also wanted to note that this is a very interesting question because the education of this generation (the follow-up specified from 1950s to 1990s) is probably having a profound effect on their contributions to the reconstruction effort right now. Aquamarine is a valuable jem sought after in Afganistan, has the collection of this valuable jem been slowed due to the mountainous cave areas being used as hiding places for loyalist to the old regime? mariam: Sorry it took me so long to get back to you on this -- I checked with several interim government sources but there does not seem to be any data collected on the effects of cave occupation on aquamarine mining. In terms of lapis lazuli, however, which is one of the best known exports of Afghanistan (I myself do not associate aquamarine with Afghanistan, but think much more of lapis and moonstone as its primary precious stone resources), anecdotal evidence would suggest that lapis lazuli mining has been unaffected by political events in the caves of the mountain regions, since every store on Chicken Street (notorious tourist destination in Kabul) has fifty brand-shiny-new lapis and silver jewelry sets for sale. In fact I am wearing today a lapis ring and earring set given to me by my great-aunt Simin . . .
How does the internet play a part in daily life in Kabul for the average person. Your question made me curious about whether there had been any follow-through on putting more Telekiosks in more post offices throughout Kabul, so I checked on the UNDP website to see what was going on these days. If you click on the -New Public Relations Experts for Kabul Telekiosks- story on that page, you will see that as of August 2003, there are now 9 Telekiosks in Kabul post offices and a number of new animators have been trained to give the free computer classes and help people use the kiosks. (It is noteworthy that UNDP Afghanistan is involved in a number of other IT initiatives including Linux training for government sysadmins and some kind of Microsoft deal.) There is also a telekiosk home page run by the Ministry of Communications which people can post comments to, chat on, search job postings, etc.. All of which suggests to me that the Telekiosk initiative is not just meant to provide accesss, but is also trying in some way to spread the idea of networked culture among ordinary Afghans. So maybe the Internet does not yet play a part in daily life for the average person in Kabul, but in a few years it might. I am kind of curious about the $1/hr fee to use the computers - I would guess that this goes back to the Ministry of Communications, but even though it is a very low fee respective to other parts of the region or similarly embattled zones (I remember in the West Bank the Internet cafes cost more like $5-10/hr), it might still exclude people from being able to use the service. Wonder if there is any reasoning there beyond the interim government being strapped for cash and the project only having one funder. What roles do women play in technology in Kabul? Has it changed since US occupation? mariam: Have not been able to find out much about this at a distance (except the fact that the UNDP Telekiosks project -- see above -- is training an equal number of women as men to serve as computer training teachers), so will try to interview some women on this topic while I am in Kabul at the end of December. Stay tuned, hope to post results in early January. �� Women of Afghanistan� Help Your Country Integrate Into the Digital Economy! Academy graduates are prepared for networking and IT-related careers in the public and private sectors, as well as for higher education in engineering, computer science and related fields. �An important goal of the program is Cisco�s Gender Initiative.� The goal of this project is to increase female access to IT training and career opportunities, beginning with the Cisco Networking Academy Program. For registration please contact Nabila Akbari and Sonia Ziaee @ 210-2341. Address: Ministry of Women�s Affairs, 2nd floor, UNDP ICT office. what is the remember of all the hippies they have been in kabul in the seventies? mariam: This is a great question which I would like to throw back out to the audience to see if anyone has any personal memories of Kabul in the pre-soviet 70s (I myself was not born yet - if you have a memory yourself you can email me at mariam[nospam]@kabul-reconstructions.net and I will post it for you.) I can tell you a few secondhand stories, though: for example, when I was living in Italy in the late 90s, I met an archaeologist who had been on an --opium odyssey-- through Afghanistan during the period you refer to, hitchhiking rides with the ubiquitous trucks on the Jalalabad road and wandering through the mountains to observe (and sample the wares of) primitive, hidden laboratories in the foothills. His memories of this time are hazy but vivid (and somewhat Orientalized) impressions of color, smoke, hospitality and adventure. My guess is that other hippie experiences of Afghanistan may have been pretty similar . . . This also reminds me that my mother -- who does not really qualify as a hippie traveler in Afghanistan since she was married to an Afghan and living in Surkhau and Kabul for three years -- actually shot a bunch of Super-8 footage in and around Kabul in the mid-70s, which I have now. I will try to get some transferred to video and upload it to the INFORMATION page of the site, if people are interested. Meanwhile maybe she will add some more to this answer when she starts posting to the site from Kabul (where she and my father moved back last year after 25 years in the States) sometime next week. THE Taliban are attacking American soldiers, half the country is off limits to aid workers and the other half is ruled by warlords. But to a rising number of adventure-seekers, Afghanistan is again a trendy place to travel. A new generation of hippies, including Britons, are crossing the borders from Iran, Uzbekistan and Pakistan, hitch-hiking on lorries carrying emergency supplies to the cities and staying with local families along the way. Belinda Bowling, a South African who braved public buses and local taxi drivers to travel from the province of Herat, near the Iranian border, to Kabul, admitted that the country wasn't for the novice traveller. "It is not the place for gap-year youngsters," she said. "But I have never encountered such warmth in all my travels. The family we met in Herat looked after us for the entire time by passing us on to their cousins. I also stayed in teahouses." While images of Pathans riding on horseback across mountains appeal to the romantic, the risks are high. Earlier this month two backpackers - a Swiss and a Norwegian - were stoned to death in south Kabul. It is believed that they were staying with a family in the neighbourhood, where members of the Hizb-e- Islami terrorist group live. It is not clear why they were killed. The Foreign Office advises against all travel to Afghanistan unless essential. Nick Downie, project manager of Anso, an organisation that provides security advice to the aid community, said: "It is high risk. Sure, it is a great adventure but there are bandits everywhere." On arrival in Kabul, most stay at the Mustafa Hotel run by Wais Faizi, an eccentric Afghan-American who keeps 54 white doves as pets and charges pounds 6 a night. "Anyone in his right mind would not come here," he said. "Most people are here to work, not have fun." What is the population of Kabul? mariam: The answer to this question is actually fairly complicated, since there has never really been a formal census in Afghanistan and the population of Kabul has been in constant flux over the past twenty years due to the various occupations, wars and comings and goings of refugees, which all passed through the city during that period. Published estimates of the population of Kabul seem to vary from as high as 1.5 million in the mid-1970s to as low as 700,000 in the early 90s (at the height of the civil war). I have not yet been able to locate population figures from any date more recent than 1999, but will check with some interim government and NGO sources to see if they have done any informal studies. My best guess would be that the population is back up to 1.5 million or more, since the flood of Afghans now returning from extended exiles in other countries has washed up predominantly in Kabul (largely due to security concerns that make other parts of the country dangerous or inaccessible), provoking an acute housing crisis in the city. For more on the current housing crisis and rent inflation, check out several articles posted last month to the INFORMATION page. mariam2: Okay, I checked some more sources and according to CARE and UNHCR (the UN High Commission for Refugees), over 400,000 people have returned to Afghanistan in the last 10 months alone (2.2 million since March 2002), with 30-40% of the returnees staying in Kabul, which means that the population of the city is now up to about 3 million. I find this statistic pretty staggering on a personal level because it means that all 160,000 of these people have arrived since I first went to Kabul last December, and everything I filmed must have changed out of all recognition since that moment. I can not even imagine what the city will be like when I go back this December, one year later - but stay posted and you will see the footage here. Meanwhile there is a funny little New York Times article on a few of the Afghans who are now making the reverse migration from Queens to Kabul, which I put on the INFORMATION page for you. mariam3: I updated the statistics above based on the new UNHCR report, which is summarized in the AP article I posted to the info page. Also posting some UNHCR press releases, articles and notes about the temporary scaling down of UNHCR returnee assistance programs, particularly affecting returns from the refugee camps across the border in Pakistan, after the murder of UNHCR employee Bettina Goislard in eastern Afghanistan last week. The returnee situation is already so fraught -- between the housing crisis in Kabul and security concerns preventing families from going back to their own villages in the provinces -- and this will make it even more difficult for many. hi, can u tell me about a boy named sohrab shaheed ? How much does a satellite dish cost in Kabul? How much of an average monthly salary is that? I would like to know what the life of an Afghan Lapis Lazuli miner is like? How long do your Children go to school? Is there different schools for boys and girls? Is violence from teachers against the children allowed? Here in Sweden it was alloved some centuries ago, and some teachers was very brutal. How can I adopt a child there?